Here's a dozen of the best recipes for pulled pork, along with some recipes using leftover pulled pork. Most of these recipes are simple to prepare and cook in the slow cooker, and there's also an oven version and one for pulled pork on the grill. The typical pulled pork sandwich is piled on buns and served with coleslaw (on the pork or on the side), extra barbecue sauce, dill pickle slices, and your favorite side dishes. Some of the more traditional sides include baked beans, macaroni and cheese, potato salad, and fries. This popular pulled pork is made with a pork shoulder roast, onions, and purchased barbecue sauce. The slow cooker makes it extra-easy to prepare and cook while you do other things. Pulled pork barbecue is always a hit with friends and family. Instant Pot or pressure cooker pulled pork is used to cook this pork shoulder in a fraction of the time. It took only 80 minutes to cook this succulent, shreddable pork! Serve it with barbecue sauce and your favorite sides. This spiced pork roast is slow roasted in the oven until it is falling-apart tender, then it's shredded and blended with homemade or purchased barbecue sauce. Serve this wonderful oven pulled pork barbecue on soft buns with slaw and beans on the side. Be sure to serve extra barbecue sauce for the sandwiches. Southwest seasonings, salsa, and peppers make this out-of-the-ordinary slow cooker Mexican pulled pork memorable. 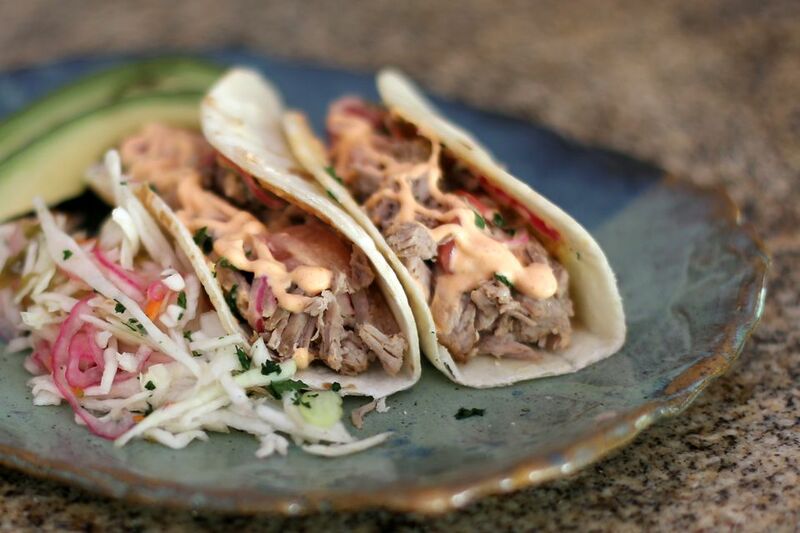 Serve this pulled pork with spicy slaw and a chipotle or Sriracha mayonnaise in soft corn or flour tortillas. This pulled pork recipe is an oven barbecued pork roast, shredded then heated with barbecue sauce, onions, and seasonings. It's a great dish for a party or big meal, or freeze the pulled pork in batches. Keep it warm in the slow cooker for a party and let guests serve these pulled pork sandwiches themselves. This flavorful pulled pork is made with a little grill seasoning, bell peppers, onions, and barbecue sauce. The slow cooker makes preparation a snap! Serve this pulled pork with peppers it with soft rolls and coleslaw. 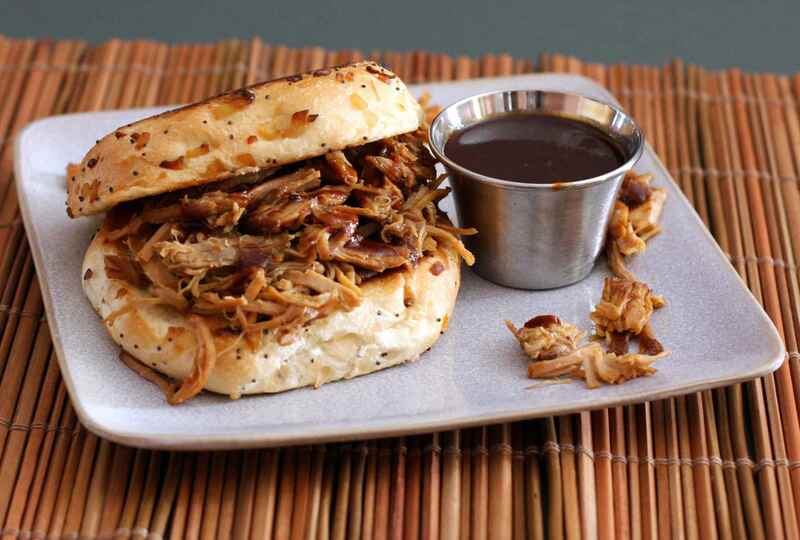 You'll enjoy the spicy chipotle flavor in this chipotle pulled pork barbecue. It's a very simple recipe cooked in the slow cooker. This North Carolina-style pulled pork makes a great weekend meal with beans, potato salad or fries, and slaw. Warm the reserved sauce and pass it at the table for people to spoon over their pork. Serve barbecue sauce as well for people who might prefer the alternative. Serve with slaw, pickles, buns, and baked beans or your favorite sides. A homemade Texas-style barbecue sauce flavors this succulent perfectly seasoned Texas pulled pork. The slow cooker makes preparation a snap. We freeze extra pulled pork to use later. These pulled pork barbecue cups are an excellent way to use leftover pork barbecue. Serve these treats for lunch or dinner with coleslaw and fries or chips. Use your favorite pizza crust recipe to make a deep dish or thin crust pulled pork pizza with a tasty topping of leftover pulled pork and barbecue sauce. Feel free to use purchased or leftover pulled pork for this pizza topping. The flavorful homemade sauce for this slow cooker pulled pork barbecue with homemade sauce is made with vinegar, ketchup, crushed red pepper, and barbecue sauce. Yes, you can cook your pulled pork on a charcoal grill! These step-by-step instructions make it easy. This oven-baked pulled pork sandwiches recipe makes a big batch, and it freezes well! The pork is baked with a flavorful rub and then it's cooked with barbecue sauce and some vinegar.